August paid off with planning, and our rest, travel and play enriched us enough to focus daily on our tasks for the past month and a half. We began our new school year, as year rounders back in April. So when September hit, we were beginning the final stretch after a break. I make sure we are learning with in and out breaths, developing the best process for our heads, hearts and hands. That is how we came naturally to schooling this way. Intuition, meditation, prayer, focus, intent, manifestation. Deepening our painting skills, we have learned a bit about Botany, with the Charles Kovac book. Geography skills have been expanded through music lessons, stories, and real life experience. I have learned more about the Old Testament stories by taking them in to my Soul and teaching, which has in turn helped me to become a more multi-dimensional teacher. It helps that I used one set of resources the first time I taught 3rd, and another set of resources this second time around. Waldorf Essentials has always been my lamp post though! 5th grade has taken us to Ancient Egypt, Ancient Greece and into the lap of Buddha. Teaching 3rd and 5th at the same time has its teacher incentives, when subjects become intermingled. In other words, I have begun to deepen my own personal web of life. Everything is interrelated. Our handwork rhythm has deepened and that makes me proud. Needle Point (with yarn) and Embroider (with thread/floss) has enriched our Souls using our Hands. Freehand Geometry is taking shape through a few Waldorf resources and I am having fun presenting the sacredness of the universe through Math, to my little learner. I intend to join the embroidering world and math in the next cycle of my teaching. I have a great recommendation for a book assisting with this, on my IG account. Also, please take a look at my personal embroider work project, which is stitch by stitch prayers for the Standing Rock Reservation against the Dakota Access Pipeline #nodapl – It is a pattern by @cozyblue, called Full Circle. This can be found #WIP style on IG. Another one of my little learners will play in his 5th Suzuki violin recital in a couple weeks, And he is blossoming in our Cooking Class. So many good things. My littlest learner is unfolding beautifully in our Waldorfy prek circle, at my home church. The Circle Time was taken on by our Children’s Minister, in which we are so grateful. Once a week for an hour and a half we get together with 5/6 other families to sing, sign, hear stories, do crafts, move, shake and laugh. We come as we are, 2 to 4 years of age, at the moment. 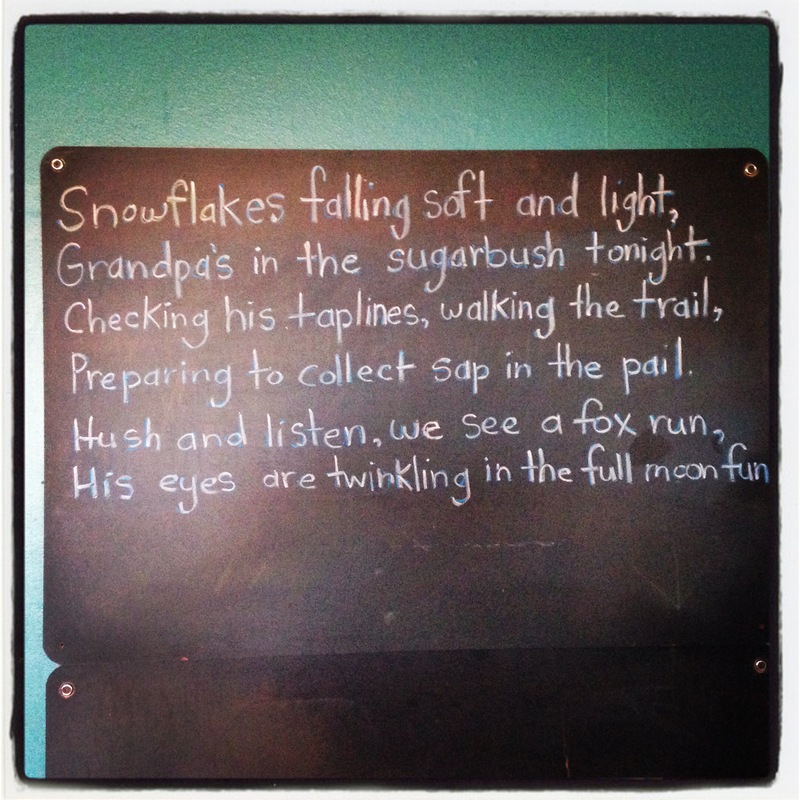 So many good things are evolving for the Wolf Pack, and Eagle Tree Homeschool. Teaching 3 age levels at the same time is a challenge, but with self care, time management, organization and Love as the centerpiece, it can be done. If you are interested in speaking with me about my experience with Waldorf Essentials, I am now a (TFW) Thinking, Feeling, Willing Leader. Please comment below or contact me healingoneself@gmail.com. TFW is a blessing and gives you access to organized, essential mama lessons. Not only will Melisa hold your hand, if you are willing to do the inner work, but I will be nearby local, in Kentucky. It helps to have community. Follow me over on IG @nurturing_spirit for daily Waldorfy goodness. If I have already referred you to Melisa and WE and you would like to be added to my secret Facebook group, just message me. I will add you. I plan to post videos, links to songs I sing for Circle Time or the Seasons and personal wisdom on homeschooling, mothering, marriage, and being self-employed (see www.coydogstudios.com and on IG @coydog~studios). I also have a secret Facebook group for Handwork, if you wish to message me, I will add you there as well. I have also organized homeschooling resources and other lifestyle pursuits over on Pinterest. We have been using Waldorf Essentials curriculum for a number of years. I have taught both Kindy through Third twice, as well as Fourth and Fifth once through. I have had the honor to hold space for the preschool years three times, with my three sons, ages 11, 9 and now 3. Join me, if you wish and I will do my best to guide you as I can. Life is a journey, and we can take it day by day together. Waldorf First Grade, Year in Review. Wow, the boys are really growing up and have shown on the outside all the inner growth of the last 7 years! Little Fox, now 8, really has gauged this for me, since we now have two older boys walking their path. He has truly set forth on his earth path, and come into his body. I mentioned the 12 senses on the last post and how important all of them are in raising children. He has taught me most about how highly sensitive I truly am. The term Highly Sensitive Person is a post in itself for another time. Either way as a parent I came to learn more about myself through watching my children grow and mirroring, as well as reflection upon my childhood. Before we review the year I want to mention First Grade Readiness. This is something you can measure by a few standards. For one, has the child lost their first milk tooth? How are gross and fine motor skills, as well as core body strength? As a rule of thumb has the child experienced seven Easters yet? Below are a couple of links expressing this thought deeper and why we waited 7 years to start academics. Most people outside of our family sphere did/do not quite understand why our children did not match up with mainstream, but I took this very big notion to prayer and specifically felt waiting for each child to be ripe was necessary. Each child is so different and Waldorf allowed me to bring a balance to each child and their differences. At first it does not appear as though our children are learning or at pace with their peers, and truly they are not. We want a whole child. A child who is developing evenly. We want their body, mind and spirit to be in sync. To mamas out there who are questioning yourselves because others are questioning you and this practice, hold steady, like an anchor on a ship in the high seas. You know what is best, somehow this seed was planted in your heart! 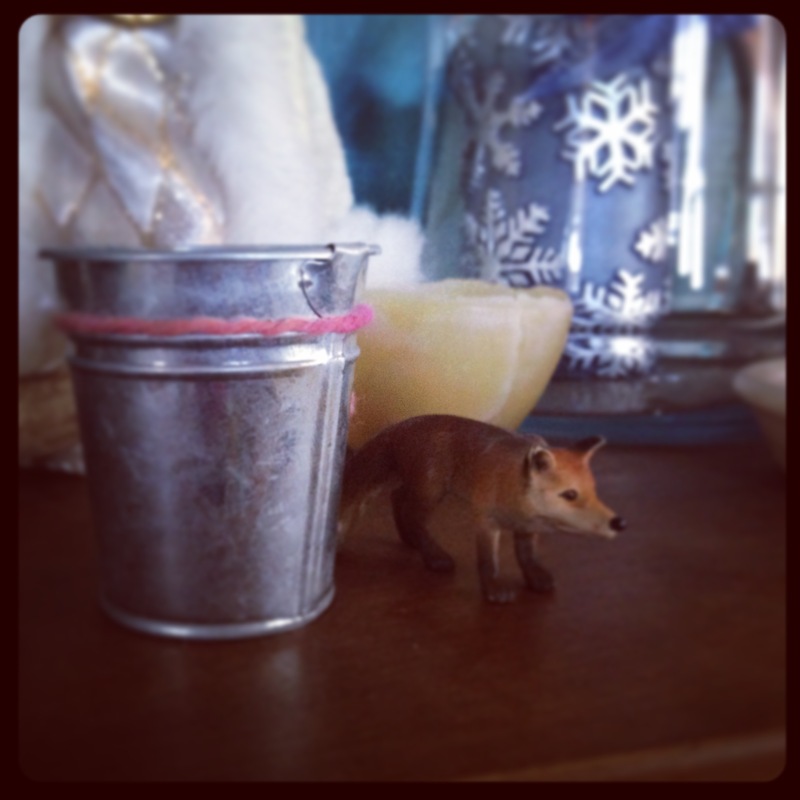 Namely our Little Fox is a cautious fellow. He likes to watch and observe before making his move. But once he moves he is graceful and confident. We waited a little past his 7th birthday to begin formal academics, and my oh my, he paced through with smiles. I love this because school should be fun, and we had some work to do the first seven years to get him ready. Auditory, visual and vestibular centers had to be assisted and balanced. Movement, sensory and games had to be encouraged. Here is my Pinterest board to give you a sense of what I look at, regardless if a child has sensory issues, in fact all children are special needs in these times when recess and art are not valued. They sure are valued here at home though! Temperament plays a role in educating and I believe Little Fox to be much like me, melancholic and phlegmatic, but when balanced, quite all four temperaments, much like the Medicine Wheel, and Carl Jung’s Wheel, when finding our Center. It is important though to observe your child the first seven years and meditate on their temperament and your temperament and right-relationship. Meditating on how to bring the teachings and how to relate can make a huge difference in how your days go. We began the year with Form Drawing. Not only did Form Drawing give us structure with using Main Lesson Books, it gave Little Fox time to practice using crayons and pencils for writing. Not only do I believe in the soul development aspect of Form Drawing, but also the quality it has to draw us into focus on Monday mornings! Monday’s are difficult for all to refocus, so doing an exercise first thing really helps us all realign where we are and what we are doing. Language Arts had us visiting Grimm’s Fairy Tales, and let me tell you they work on the soul differently as a child than they do when we are adults. As adults we bring our baggage to the stories, unless we let the stories take their time to work on our soul too. Some people even believe they are gruesome, and perhaps they are a bit, but the things on television for children that have no soul are far more violent. I can understand how a highly senstive mama might think twice while reading the stories beforehand, but if you approach the stories archetypally, then they are very insightful and assist growth subconsciously in the first year grade, also known as the 7 year change. In the first grade letters are introduced to the children through a re-creation of the evolutionary pattern of language development. The letters are drawn out in practice books and Main Lesson Books to make a picture in itself. Like the letter M in the story Simeli Mountain is actually a part of the Mountain, and there is room left for a short summary of the story, which is beginning writing. Math. Arabic Numbers one through 10 are introduced along with Roman Numerals and a story. The Four Processes are then introduced using a storyline and manipulatives. With our first son we actually used a Star Wars theme, but with Little Fox we used gnomes in a kingdom. It was just easier to use the traditional approach with our curriculum, the story was already set up. Our curriculum teaches Whole to Parts. For example, 10 equals 5+5, 9+1, 1+9, 10+0, 0+10, 7+3, 3+7, 5×2, 2×5, 10×1, 1×10, 11-1, 20-10, 15-5, 20/2, 40/4 and so on. During the winter we do daily math practice to keep up with what we have learned and to make it easier for entering into the next year. Winter and reviewing is where we are right now, as well as planning and dreaming for a new start. Daily math practice is suggested in Circle Time, which takes place when we say our opening and seasonal verses and play our games. This is when I might encourage my older child to jump on the trampoline and say his multiplication table. Or if we are taking a walk we may try to find straight lines and curves in nature to compliment beginning form drawing. We still do Circle Time our with First and Third Graders together filling the time with Brain Gym activities, movement like stretching and yoga, reading, and music practice. Waldorf Education has a curriculum for its students that reflects a pattern of evolution that is apparent in both the evolution of humanity and in the development of the human being. 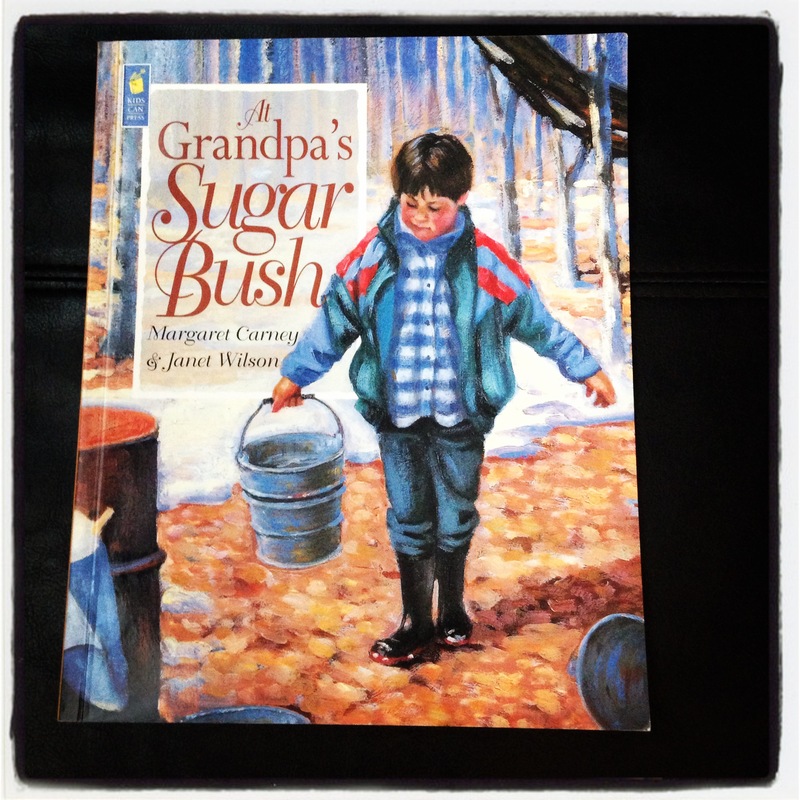 For the sake of the developmentally appropriate introduction of information to the young child many traditional forms of academic instruction are held back for an older age. The three stages of development in childhood are birth to seven years of age, seven to fourteen years of age, and finally fourteen to twenty-one years of age. Waldorf Education for the birth to seven stage concentrates on learning through activity (Hands), seven to fourteen through the feelings (Heart), and fourteen to twenty-one through thinking (Head). The Head aspect we are covering with Language Arts and Math, however we introduce the Heart aspect through painting and music or song. We have a three day rhythm where I introduce a story and the student draws the story in a practice book. The second day the student paints the story and retells it. The third day we model the story and enter it into our Main Lesson book. With this rhythm Little Fox came to digest the story and the teachings and make it a part of himself. I could not believe how well he came to know the information and in a way that was filled with art and music. Music and song entered in mostly through the festival life, like Candlemas. We did not paint or model every single story, but occasionally we reenacted the story with peg people or action figures or even ourselves. Handwork is introduced this year with beginning knitting. The student is taught to cast onto needles they make themselves by sharpening then sanding the ends of a dow rod, then adorning one end if they so choose. For Little Foxes first project we slowly and surely knitted an organic cotton wash cloth. I paired his cloth with a bar of my soap and we gifted it to the Church Bazaar, which is a fundraiser. Music has always been a part of our lives in some way or another but this year Little Fox stepped up his involvment by attending Children’s Choir at church. Before he had attended Music Together classes when he was little and then again with Little Bear. Last week Little Fox began his journey with violin. For three bars of my homemade soap we rent a violin, bow and case. We have a teacher for private and group violin lessons and it turns out she was home educated. Another activity that was very much enjoyed this past year and begins again in March is Archery with our local 4H club. Little Fox was in the Clover Bud section of the Archery team, which means he cannot compete till he is 9, but we are all okay with that. I was happy to see my middle guy really blossom this year. He is sweet and giving. The year really culminated last night when he finally lost his two front upper teeth. He had been hanging onto those teeth for an extra amount of time which in my meditation meant he was unwilling to let go. Birth to seven years old was comfortable and special, and he didn’t care to leave the wonder days behind. It is all bitter sweet. We want them to grow straight and strong into the future, but letting go is more than hard. Thanks for reading Nurturing Spirit. I hope you enjoyed this post and perhaps gleaned some wisdom from our year end review. I know reflection is just as important as having lived. So it goes, the seasons of the year. Winter seemed like it would never come. The cycling of moderately warm with one week of frigid temperatures that drove everyone indoors and to the comfort of their hearth. Then, back warm again. Friday night the snow poured down with 4-6 inches of perfect powder in Central Kentucky. Enough for the children to jump and do the happy dance, bundle up and head to the big hills for sledding. While they were gone Little Bear and I stayed in and happily made a slow cooker white chili and a small batch of amaranth crackers. I’ll show you that recipe in the next post, super easy! Meanwhile we played and ate, had baths and napped, then on to planning for the week ahead. I love it when I get that much-needed quiet time to reflect upon each of my children and to bring them what they need each day and each week. Prayerful parenting. We are finishing up Third and First grade on a year round schedule. For Third Grade our Language Arts is The Old Testament, Pearl S. Buck version and Jewish Festivals. In Third we review all the four processes, but really spend some time with divide, so that we are ready for fractions in the next grade. First Grade is Grimm’s Fairy Tales, letters, word families and numbers, as well as the introduction to the four processes. All grades we continue Form Drawing, and art serves a big role if you can imagine. Movement is also one of the top priorities with children as well. Getting that body going gets that brain going and learning becomes a part of the whole. Meanwhile, I am reviewing Fourth Grade to teach Eagle Boy. Norse Myths, Viking life, a Man and Animal block, grammar and Fractions. It is my plan for Eagle Boy to also do more woodworking, carving and tool making, as in perhaps making a knife. We will probably order the blade, but perhaps we can work something out with our neighbor The Blacksmith. Winter is the time I plan and dream for the children, the family and the new year to come. Spring is when the seeds are planted, but really around Candlemas. Summer is when we tend those seeds. Fall is a time to harvest, and clean up from the year. Then, we cycle around to Winter again. With Little Fox, I will teach Second Grade (my second time around) and we will cover Saints and Fables for Language Arts, the four processes more in-depth, especially the multiplication table. He is really growing and learning. Cub Scouts is a new venture for him and I couldn’t be happier. Both big boys will continue choir, after a summer break. But on my mind and on the schedule after Papa Bear finishes with Kentucky Crafted in March, is getting the chicken coop yard redone. I have redesigned the yard in my mind and will give the details to the boys and Papa, but it is up to them to do the work. I hope to save some of the chicken wire we have and just clip it loose. Then, we need to reframe the yard to be as tall as an adult. The short yard we had is just not practical, and I wasn’t happy with it the first time around. Not to mention there were several holes in places where predators stole and killed our girls. Raccoons, foxes and such. I saw a fox by the mailbox one day, and we have seen raccoon tracks over near the coop as well. Our kitty huntress even brought in a stinky, musky adolescent weasel last year, dead, and in my basement, ew. 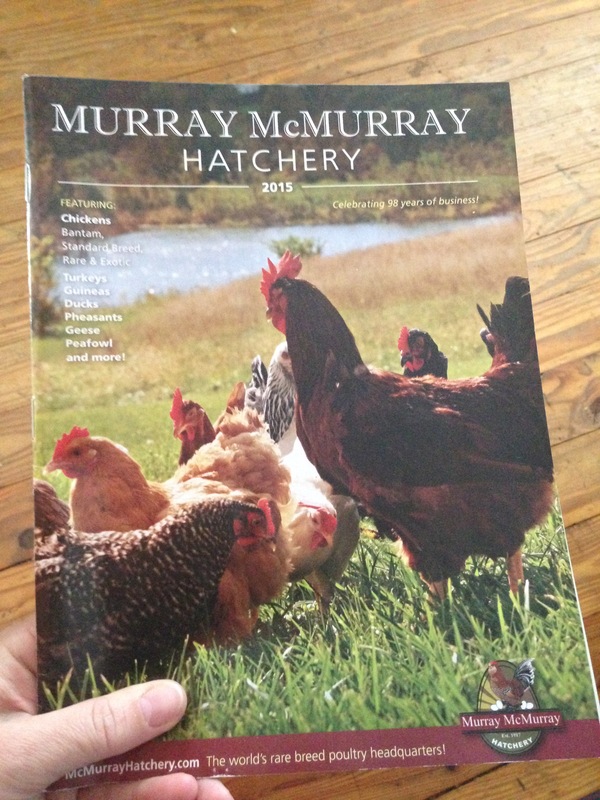 So above is a picture of the Hatchery’s catalog of breeds. Many to choose from, including turkey’s, guineas, ducks, peafowl and more. I think we will get some standard heritage breeds, perhaps some exotic or rare breeds and a few Guinea’s. I would like to build a box out at the coop for the littles. We had kept them in our basement before, but I am over that convenience. It makes more sense to have them out at the coop, safe, warm and contained. I told the men and boys of the clan though, we won’t see a delivery till the coop yard is finished, so I hope they get to it and work hard. I know Eagle Boy wants the return of chickie’s, and Little Fox does too. I am sorry to impart this information on you, but you should know. I ordered some babies and anticipated their arrival last Spring. Lo’ they never came and I was quite upset, even though they did ship. Somehow they were lost, and to me that means dead. I was sent another shipment, and worried to pieces. They came safe and sound, but I want you to know this is a possibility. Evidentially it happens, but hopefully not often. What are your plans and dreams for the year ahead? What about the next couple years, any ideas? I think it is important to hold them in your heart a bit and dream on it. If certain things won’t serve you, discard them. Until next time, sweet dreams. This is a deeply personal story of healing. A short story, as far as stories go. The important parts are here. A story of healing and humility. A story of a heroine and a villain. Sometimes they are one in the same. The year of the (work) horse has been a year of challenges for my family and it has been filled with internal struggle that has neatly unfolded into chaos in our outer world. As a spiritual person I seek the path of peace. Comfort and heaven. But I do not deny my shadow side. The darkness otherwise known as the womb from whence we came. To many people I am seen as strong, too strong probably. Positive. Believing. Perhaps people see through me. Am I transparent? I do Believe! I am positive and authentic. But internally I have had a different dialogue competing with God’s plan. First know that I am a stay at home mother, called by Creator to home educate our children. This path comes with a lot of inner work. For some time now though I have been denying what Creator has been telling me all along. Creator TRUSTS me to raise our children in the way I have been Called forth. However, with my egoic self-talk I have continually repeated over and over that I am a failure, and I have held high expectations over myself that anyone would have a hard time reaching. I doubt. I punish myself for every. little. thing. I allow others to judge me or not understand my path and then I take that burden upon myself, when it is their perception or truth. I sometimes have little self-worth or self-love. Meet the villain. Shame and guilt are old patterns of the patriarchal paradym. I have worked really hard to purify my heart the past 10 years. I have worked hard to find balance, happiness and self worth. What I did not know is that this pattern runs deep. Deeper than any well you have known. It is the endless well of our soul, and it is Collective. What I have realized is I do not need to be such a warrior, not when loving is more in line with what God wants for me. And I do really need to start putting myself first more, no, not first, but definitely not last. To share my struggle deeper you must know our family has started a business. We began a little over a year ago when my husbands former employer closed its doors. We had been headed towards this goal in our dreams and hearts for a decade and it was finally manifesting with right-timing. In October, we moved from our original location to a new location much better suited for artists. Many positive small victories have happened. In this time, and in the whole past year my husband has worked day and night to push, push, push our business to the next level. In that time, we had another baby. Our baby has brought so many smiles, healing and love to our home. A peace admist everything else. Meanwhile, I continued to home educate third and first grade and nurse our wee one. I do not get a lot of help when it comes to babysitters, due to an attachment-like parenting lifestyle. I do not go out with friends to have a girls night out or date night with hubby. I do not have money at this time to buy a lot of things, but we always have a roof over our heads and food on the table, and we are building our dreams one day at a time. And when time allows we do activities as a family, but we do know we could play more. Creator has made sure to anchor me to our home, so I may learn what it truly means to hold space. Our home is a place I can learn reciprocity and self-worth. Value. I knew something was going on internally and that I was headed on a special journey “home.” I just couldn’t name it all. So writing helps me to bring that which needs to be named out of my alchemial heart. Not everything happens easily, and hard work is important. We cannot run from our choices and responsibilities. There is so much here, so many layers to this story. One thing always gets me on my knees though. Illness, dis-ease. In the past month we have struggled with two types of flu strains, the rhino virus, ear infections, sinus infections, bronchitis and conjunctivitis. We are a family that has not been to the doctor, except maybe once since 2010. I pride myself on being healthy, eating well, drinking green and being generally happy. In my darkest place during these times of imbalance Creator is trying to speak to me. Creator wants my attention. Instead of guilting myself because I “let” us get sick, I need to love myself more. Love is the message. It is a message to the Collective Conscious. To me, to us all. I am a good mother. We are all doing the best we can given our circumstances, and it is time to let go of the past. It is time to let go of the guilt and the shame. The time is for forgiveness. Self-love. I forgive myself. I forgive family, friends and mentors who were a part of learning experiences that hurt my heart. I forgive. I trust. I trust Creator knows what is best for me. I trust all experiences for me will not be comfortable. I have learned that I depend on security. I depend on my husband to take care of us. I have come to depend on Creator to take care of me, but sometimes that actually looks like chaos. It looks like chaos because that is what is needed to come undone. Coming undone is what is needed sometimes to move things out of our way or to rearrange our lives for better things to come. I have learned I don’t have to be as strong as people might believe I am. I have learned that it is okay to let go and be in the middle of the river of God’s creation. I don’t have to hold on so tight, or fight. Transitioning into owning our own business has been uncomfortable. I have been shaken to my core, so I can be better. I have been shaken, so I can recognize my human-ness. I have been shaken, so my heart can open a little more and so that I can stop the guilt and the shame of my inner voice that I am never enough. I make mistakes. But that’s okay. My kids still love me. As a matter of fact, my oldest son repeatedly tells me over and over and forgives me over and over for making mistakes as a mother. He is Creator’s proof! Unconditional love is the teaching. Gentleness with self, kindness and patience are the teachings. Creator is speaking to me about motherhood. About human-ness. My job is important. I do take it seriously in my heart, but in my head I fight the battle that can never be won, because it is not in alignment with Source, with Love. No matter your path, whether it is home educating, public school, private school, a career, single or married, or parent to fur babies…you are a masterpiece. You are Right Where You Need To Be, so just love. Love yourself. Love those around you. Be thankful. I am truly a grateful woman, but I lost myself a little bit these past two months, in order to find my core. What a journey it has been. I do not ever want to deny my struggle. I do not ever want to deny my darkness. I do not ever want to deny being vulnerable and allowing others to help me. The time is done to overly protect myself from reciprocity. The time is done to overly protect myself from receiving love, especially self love! My job is important. We each have a Mission. A Calling. When our energy is alignment with our Sacred Contract, we are working well with our personal power. In the midst of my struggle this past month I read a quote about personal power, but I was having a hard time Knowing what it Really was I was suppose to Be doing. I have been walking my path all along, except it was loaded with self-talk, fear and a warrior attitude that was not allowing me to stand in my full power. I had energy leaks, and distractions coming in left and right to take me away from my true journey. I have not been able to use my energy wisely in accordance with my Sacred Contract with Creator. I felt dizzy. But I can See now, except I have conjunctivitis…ha ha Lord! See, Creator is funny. Creator is a comedian and Very Contrary. Creator wanted me to See. Creator wanted my attention, so from the Spirit World came the teaching over into the Physical World. Open your eyes beautiful Nichole. You are Love. And when you are down, you need more love Nichole. Not shame or guilt. Not fear mongering. I am finally smiling for the first time in two months and that tiny bit, that tiny spark is healing to me as I walk the Advent walk to Christmas. My personal rebirth. I read somewhere to allow my heart to be the crib for the coming of Christ. That is so comforting to me during this time. To be able to receive Unity and Love. I am a new person. I am definitely not the same person as I was last month, or even yesterday. I am imperfectly unique. I am a good mother. I am a good wife. I am a good sister and daughter. But, I am also really good at making mistakes and listening too much to my ego at times, but that’s okay. I am still good. I am Love. I have a lot of hard days that do not end up on social media. But, the better days win out. The days where I listen to my heart beat out the worst days. I love what I do. I love my path. I love that Creator loves me enough to shake me up from head to toe to get my attention. I am grateful. I feel Still and not restless. I don’t mind doing this work. It is a hero(ine)’s work. It’s what I came here to do during this time on earth Our Ancestors foretold the healing women would do. “The Hand That Rocks The Cradle Is The Hand That Rules The World.” I am a healer, to myself and to the Collective. I am a teacher. I love teaching, and anybody who doesn’t understand what I do and that Creator Called me to it isn’t suppose to understand. Because it is my journey. Finally, I can say I am grateful after waking up each day in November and these few days in December feeling miserable about life. Every mistake I had ever made, every. little. thing. including making a wrong turn driving, not having a perfect house, not having a “career” others could define me by that made money had been under personal scrutiny by myself. Which is really silly. It is impossible to continually live like that even though I was mostly a happy, believing, loving person. I found also that I tended to believe and love others more than I could love myself. I tended to forgive others before I could forgive myself. It’s time to break through that wall. The fighting is done and Love is here. We are hero(ine)’s, the mother’s, the healer’s, the lover’s. I know I am important. I am love and I love others despite the journey, the circumstance or the teaching. If you are are guilting and shaming yourself for one reason or another, especially under a mask too afraid to be vulnerable, I…well I am not sure what to say other than perhaps my story can spark some healing in your life. You don’t have to be strong all the time. Take off the mask and lay it down my dear. There is only love. Open your hearts and find your sacred song. 2014! With plenty of preparation work for two years, life has been like a spool of neat thread unwinding itself and revealing what is being made. Cedar blessed us with his arrival last October 2013, and we settled deeply into dreaming and planning, as we do in winter. Slow. Winter. Good. We had enough inner light to burn our way through the darkness of the cold season until Spring. For most homeschooling families February is a transition month. Cabin fever. Spring wants so badly to arrive, but Jack Frost sometimes lingers and the roots are reluctant to send the energy upward. The Light is yearning to unite fires within us again encouraging springs in our step, curls at our mouth and early spring morns on the porch with breakfast. Preparing for Third and First Grade has been a lot of fun. I have enjoyed deeper spiritual learning with our main lesson of the Old Testament and Grimm’s Fairy Tales, with the archetypes. I keep in mind specific goals set for each child. Movement is always at the top of the list, rhythm and anchor times equally important. I feel blessed to observe, pray and listen for each child. Listening to Creator brought me insight to adding more music this year assisting the nine year change and seven year change as well as transitioning our little nursling with us through the day. For our Native American block the boys have deep roots and some live education with Elders from the Hopi and Choctaw people. As their parents we have spent time doing our inner work with the encouragement of these Elders, their ceremonies and wisdom. All of that has carried over into our daily work. We have some unique teachings to bring to them. We also provide Buddhist, Sufi and Christian teachings. I think it is important to recognize the Ascended and Holy Peoples and to make available a universal language. It’s all about communication and connection, whether you prefer psychic or prose. Music. Our circle time music has been our own songs that inspire us, and the Summer Songs from Music Together, which is Cedar’s baby music class playlist. My big boys are helpers in the music class and I see them getting so much out of the experience. For one week we spent time at the lovely First Christian Church Music Camp, in my hometown. I adored the music teacher and the kids. They worked hard with a tight schedule to really learn alot. I am impressed at the growth and stretching they had to endure. I felt I could See the transformation of their hearts and throat chakras. Flowing. Singing is magical for many reasons. The breath of Creator is at work. Movement. I have been spending time with the boys this year learning about stretching the body and becoming more aware of their spiritual vehicles. Everything is sensory. Stress can be useful but also dangerous, so we have spoke some about how important drinking water, taking salt baths, regular bedtimes, clean foods, and movement can help assist our sensory experiences. Creator wants to come through us and touch all the materially dense richness. The earth. The wind. The warmth of a hug. The cool water that flows down our throats. Thankfully we have added new elements to our movement apparatus, like a slackline and trampoline. Existing equipment includes a zip line, 4 acres to run and bike. Trees to climb. Porches to swing upon, especially when it rains. Wood to chop. Fires to jump. Critters to feed. Free play. My boys do not lack for play time and joint compression. They are very creative and I have always nurtured and assisted that play with props, dolls, action figures, furniture, lighting, wall paint color, board games and card games. Natural materials are preferred but we possess some vintage classic toys. I do see the difference in feeling the materials personally. Plastic is cold. Handwork. Handwork is many things. A nine month old baby is handwork as a nursling. My handwork. 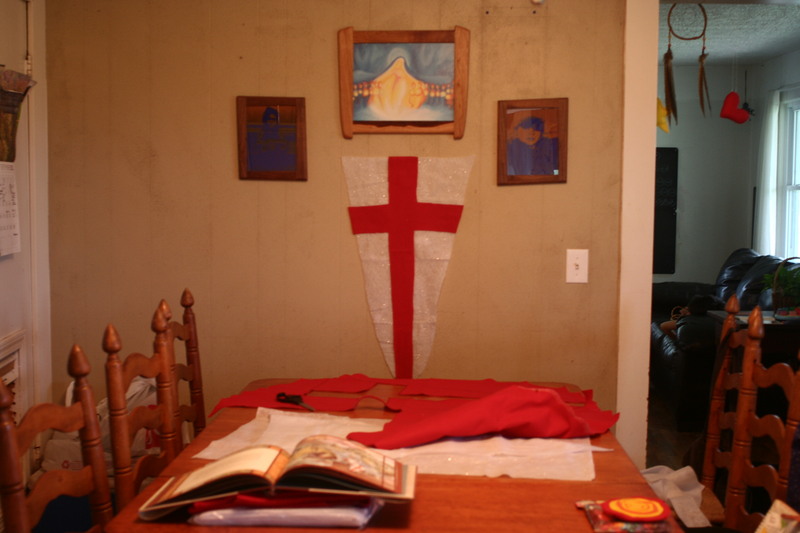 Handwork to the boys is taking care of their room, arranging a shelf or an altar. Brushing their teeth. Learning to knit a row. Taking blocks out and putting blocks away. Chopping wood. Whittling a stick. Modeling with mud, clay or dough. Sanding or polishing. Sewing. Picking up baby brother and helping him explore. Watercolors and Wet-on-wet. I’m trying. A couple years ago I presented the color wheel teachings to the boys. I am revisiting watercolors again, the brushes, the feel. I have Painting With Children by Brunhild Muller, and the Waldorf Painting Education binder. IT’S HUGE, and I haven’t made it all the way through. I struggle with building scenes and I always add too much water! I am a work in progress. Drawing. Chalk drawings and practice drawing have become staples in our process. We ingest the stories of each grade that are developmentally appropriate, draw and retell the stories. Some we love and some we take in and think maybe work is being done on us in the night by the angels who know better than we do. Angels. Archangels. Archai. This is truly a personal relationship. We each have one for ourselves, as a group, the community, the earth and so on. Many times I go to the angels when I am struggling. But I do see them in the everyday, like when Cedar discovers his own voice. Or when River smiles at me shyly, and how he always nurtures me. Wolfsion, he champions as a helper to me and the land. He’s a steward. A trailblazer. Waldorf Essentails curriculum, Melisa Neilsen homeschool teacher trainer and consultant, the Thinking, Feeling, Willing group of women on Facebook and my own spiritual path have been critical. Aside from doing a lot of listening to my Maker I try to keep my influence minimal or I can easily get distracted. I find that continual purification of the mental, emotional, physical and spiritual intelligences are absolute for the path. Each of us have a process. Recently, I disconnected from the grid for a couple of months and the time away really energized me, renewed me and helped me ground into my present life. We discover this as our intuition, the angels, our children and our own paths merge. It is also when we decide to manifest and come in tune with our soul that our Path becomes clear. Rhythm. I need structure, but love the permission to unfold freely within that structure. Like the earth and the water flowing through and around. I allow space for the kids to unschool themselves with my guidance also. There are some days where that is absolutely called for. At some point I may share a photo of our schedule, it comforts me and transforms through the year, as we school (a)round the wheel. In and out breaths as the masters speak of in early childhood with anchor times, sleep, play, handwork and meaningful work are so very important. They are important to me as the teacher and as a human in grounding to this earthly experience. Life is intensive, but it all depends on how committed one is to the process and the path chosen. I am working on my Calling and Mission and that changes as the faces and places change, but the sanctuary and the familiarity of home remains. Farm and home. For us this block blends nicely with our geographic location of Kentucky. Bodies of water with as much shoreline as Alaska. Rolling hills and knobs. Bluegrass. Large and small scale agriculture. Farmer Boy, by Laura Ingalls Wilder is a good Wednesday read, coupled with our nature-farm jounral. The boys draw pictures, write summaries and include math measurements or calculations to describe their work. We raise a few chickens, a turkey and a rabbit with a cat and two dogs, along with a children’s garden. That proves to be plenty of work for us. Cursive has been pleasant and enjoyable. I liken it to form drawing, so we do it two times a week. After bringing forth the letters, we are now practicing cursive words and seasonal verses. Admist the birth of our baby and a new school year we have also birthed our own family business that has grown over the last 12 years of hard work, and we will be celebrating our one year anniversary as Cedar turns one in October. I am so proud of my husband for his work ethic, his talent and his ability to (at least) appear like he has left his work stress at the door. When he enters the house, he gives us himself, which is a gift. Check out http://www.coydogstudios.com or visit us on Facebook at Coydog Studios. We are also on Instagram Coydog_Studios and Twitter. Thanks for joining me here in the studio. This month we are taking a close look at the Michealmas Festival. The story of St. George and the Dragon, and Archangel Michael. With my Margaret Hodges book, St. George and the Dragon to inspire us, we made felt banners as visual imagery. If you are wondering where I got the large felt, it is actually a Christmas tree skirt. My mom picked it up at Michael’s on deep discount. I had no idea what I was saving it for, but now I know. The white felt is embedded with glitter, which bounces light nicely. I made three banner flags. One for the kitchen as you see. One hanging on the boys bedroom door, and a small one for our nature table. I got the fantastic verse below from my homeschool consultant and the Thinking, Feeling, Willing program, through Waldorf Essentials. I dare to fight fierce dragons bold.